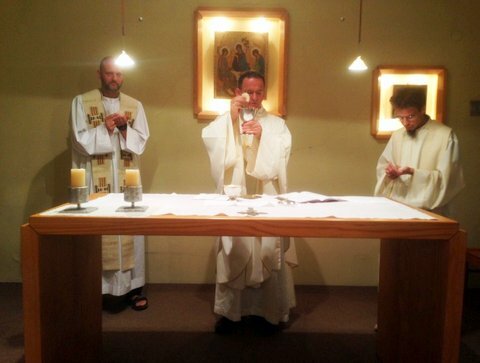 On Sunday evening, October 12, 2014, the Beer Sheba parish celebrated its patron saint, Abraham Our Father in Faith, and bid farewell to its parish priest, welcoming the new parish priest. At the celebration of the feast of its patron, the Patriarch Abraham, the Beer Sheba parish bid farewell to its pastor of three years, Father Gioele Salvaterra. Father Gioele has been recalled to his diocese in northern Italy by his bishop, who needs him as the number of active priests in the diocese has dropped. The faithful gathered at the Mass gave thanks for the gift that Father Gioele has been for the parish and for his faithful service. At the same time, the parish welcomed its new pastor, Father Piotr Zelasko, who had served until now as the priest responsible for the Jerusalem kehilla. Father Piotr has already moved to Beer Sheba and begun the important work of renovating the parish house. The Mass was celebrated by Father David, responsible for the Hebrew speaking Catholics in Israel. In his homily he focused on Abraham and the responsibility of a parish named for this great father of faith, particularly the call to hospitality. The chapel was full of faithful, reflecting the beautiful diversity of the faithful in Beer Sheba, Jews and Arabs, migrants and students, young and old. The Mass celebrated in Hebrew included also a song in Arabic and the Indian faithful sang as well a song in Malayalam at the reception that followed the Mass.